There’s one big reason that political candidates for office – especially local candidates – send nice glossy mailers to the voters. They work. Despite the proclamations of those who say that mail is dead, it’s not. The proof is in your mail box in the weeks and days leading up to an election. While texting, email, and social media have replaced many forms of mailed communication, especially personal letters and thank you cards, good old fashioned direct mail is often key to a winning political campaign. It’s all about the data. When it comes to voter data, you can’t always get a voter’s email address or telephone number. But you can almost always get a voters home and mailing address from your elections official or a reputable data vendor. Home addresses allow you to go door by door to get your message out to your key voters and get signs in their yards. Mailing addresses allow you to communicate directly to targeted voters with nice big eye-catching glossy mailers. And unlike precinct walking, when you send out direct mail, you’re not talking to one voter at a time – you’re talking to thousands. For most campaigns where I am the consultant, the largest budget line item is mail. I like to send a lot of it and will sacrifice many other potential expenditures to keep the mail going. When it comes to direct political mail, there are basically two kinds: big glossy flyers and letters. Letters are very effective when introducing yourself to voters or touting a major endorsement, as I discussed in this article. Glossy mailers serve multiple purposes, such as building name identification, spreading your message, grabbing busy voters attention, sharing endorsements, defining your opponent, and the list can go on and on. That said, there are several things that good glossy mailers have in common. You can either send an oversized postcard or a large brochure. When I say big, your postcard should be 8 1/2″ by 11″ (or a variation close in size to those dimensions) and your brochures should fold to that dimension, or close to it. Too many candidates try to do their mail on the cheap and go for smaller sizes. It’s a waste of money. When it comes to political mail, size does matter. If you do a small glossy mailer there’s a good chance it’s going to get overlooked. It’s going to get shuffled in with other mail and not looked at by the voter, either when they get it or ever. Your mailer needs to be big and stick out so it sticks out, literally, from the other mail. If you want to send a smaller mailer, send a letter. There’s a better chance that a voter will read your message in the letter than if they look at a tiny postcard. Here’s a good example of why you want your mailers to be big. 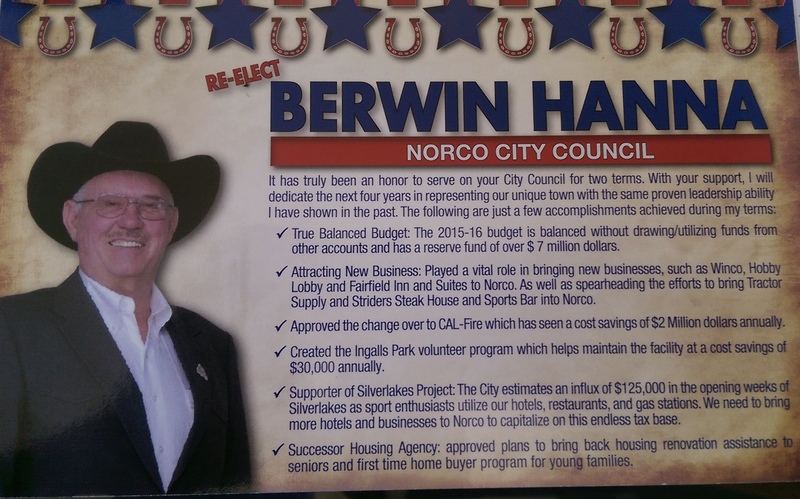 In 2015, Berwin Hanna sent this half sized postcard to voters in his campaign for re-election to the City Council in my hometown of Norco, California. It’s dimensions are 5.5 inches long by 8.5 inches wide. Blown up on this your screen it might not look too bad. But in a voter’s mail box it’s quite likely to get lost in the shuffle. As you can see, a regular envelope completely covers Berwin’s mailer. In no way does it jump out at the voter. As I wasn’t working on his race, I’m not sure why Berwin went small on his mail, probably because of money. Fundraising for campaigns is incredibly difficult in Norco. However much money he might have saved, it wouldn’t have cost much more to send an 8 1/2″ x 11″ inch glossy mailer postcard instead. Berwin did win re-election by the way, but it had little to do with his mail. He’s a popular councilman who had already served two terms in office and was the most recognizable name in Norco on the ballot in that election. But eight years earlier when I did mail to get Berwin elected to the Norco City Council the first time, all the mail I did supporting him was nice and big. Your name should be the biggest thing on both the front and the back of your glossy mailers. Name identification is one of the most important things a candidate needs in order to win an election. Unless you’re a political junkie like me who hordes the mail I get to compare, criticize, and sometimes get inspired, people don’t keep political mail lying around. They throw it away. Since that’s where your mail is going to wind up, make sure your name is big, visible, and clear to read on both sides of the mailer. That way, even if a voter doesn’t read your mailer, you implanted your name in their head for when it comes time to vote. 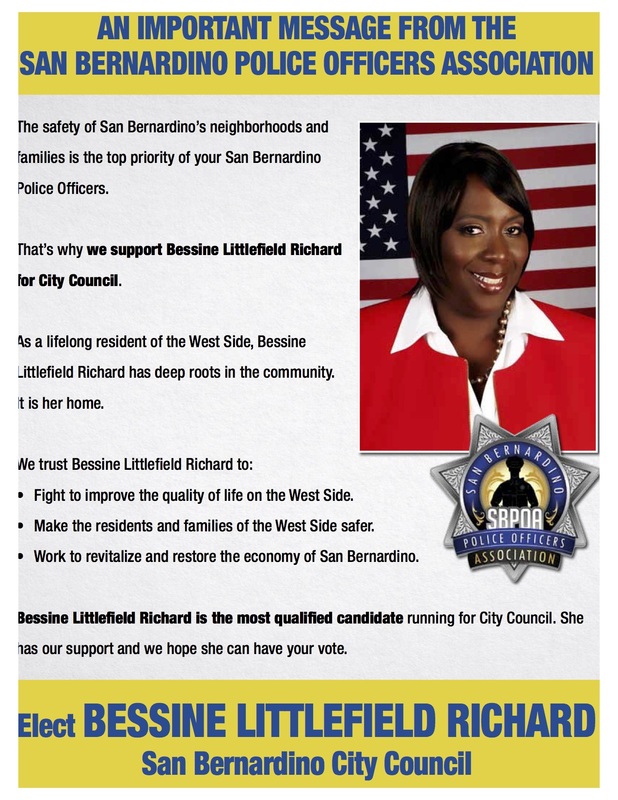 As you see in the example below (which was the front of an 8.5″ x 11″ postcard), although the messenger for the mailer was the San Bernardino Police Officers Association, the biggest text on the mailer was the name of the candidate: Bessine Littlefield Richard. As stated, your mail is usually on a one way trip from the voter’s mail box to their trash can. To convince them to take a second look and give a quick read of your mailer before it lands in the coffee grounds at the bottom of the receptacle, you want the mailer to draw the vote in. This is accomplished by using bright or contrasting colors, intriguing images, and words that stimulate ones attention. If you use drab colors, dull images, or boring words, even the voters that like to take the time and read political mail will come across thinking you’re drab, dull, and boring. Those aren’t typically the words voters use to describe leaders, and voters like to elect genuine leaders when they can. One other thing to note is that red, white, and blue are not original or eye catching colors in these here United States. That color scheme has been around since about 1776, and voters have become desensitized to them. A lot of candidates who hire me insist that their colors be red, white, and blue. I respect and admire their passion for America. It’s mine too. However my job is also to win elections. If I can talk them out of that color arrangement so the mailers can catch more voters attention, I will do that every time. In the mailer I did for Bessine, we went with blue and gold. 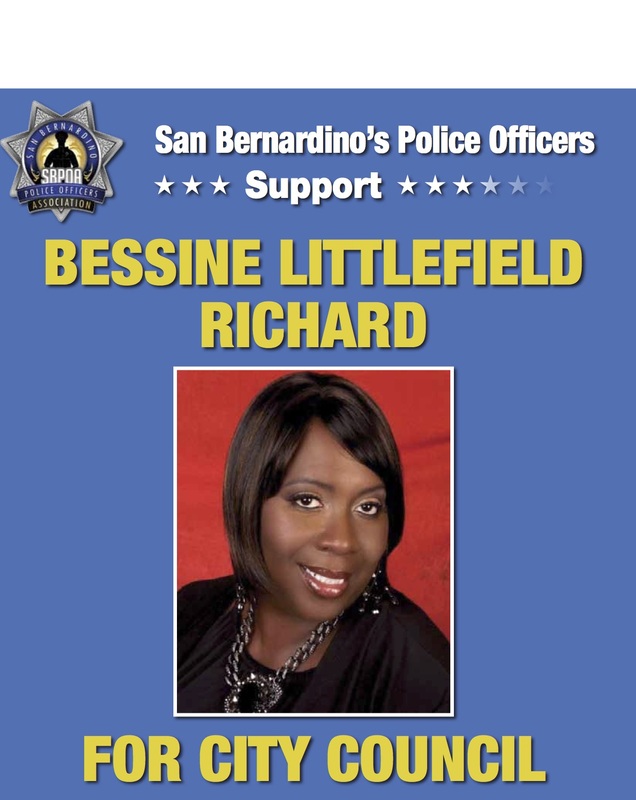 The inclusion of the San Bernardino Police Officers Association logo also helps catch the voter’s attention. When you do a glossy mailer, you must resist the urge to tell the voters everything about you and what you want to accomplish if elected. You need to stick to big headlines with short sentences and blocks of text that are only two or three sentences long. People read skimmable content. If your content is not skimmable, you are asking the voters not to read it. Nothing turns off a reader like block of text. Make sure the copy in your mailers is short and sweet. Make your point and move on to the next part of your story or message. Your font for the text on glossy mailers should be set at 14 point, sometimes higher, but not less than 12 point (unless it’s a footnote or something, and that should be in 8 point at a minimum). Headlines should be in much bigger font so they stand out. Not only does this draw attention to the text, but it allows the voter to understand your message without having to read more than the headline if they are busy. Seniors are the most consistent voters and eyesight goes as we age. Make sure these crucial voters don’t have to struggle to read your mail. The more white space on a page, the better off you are. Your mailer is skimmable and therefore much more likely to be read by your intended audience. On the back of the postcard mailer for Bessine, you can see this principle at work. We are an extremely visual society. We respond to things are eyes are drawn to. Words on a page generally aren’t on the top of that list. The proof is on Facebook. Still pictures and images generate more engagement on Facebook than text only status updates. Video however gets more engagement than posts of pictures and still images. This isn’t unique to Mark Zuckerberg’s social media baby, it’s been true long before the Internet. For a movie to be a blockbuster it needs to sell millions of tickets and rake in close to or over $100,000,000 in it’s first three days of release. But for a book to become a bestseller it only needs to sell about 5,000 copies in a week. Big difference for success in these two mediums. Visuals win out over text time after time, so your glossy mailers need to be visual. The artwork and the pictures need to be good. And you should have as many pictures as possible. This doesn’t mean you have only pictures in your glossy mailers, but having half of the space for images and half for text is a good goal to shoot for. If one of those percentages rises it should be on the side of the images. On the front of a brochure, the pictures and images may in fact take up 70% of the space. The only time you can have more text than images on a mailer is when it comes to your endorsement list. If you have a ton of endorsements and want to publish them, by all means do so. But this exception actually proves the rule as the endorsement list as a whole is actually a great visual image for the voters to get a snapshot of your supporters. Your pictures also need to be of good quality. If you don’t have good photos, hire a photographer to take some for you. It costs some money, but since we are such a visual society, they can pay for themselves in terms of you winning your election with good mail. 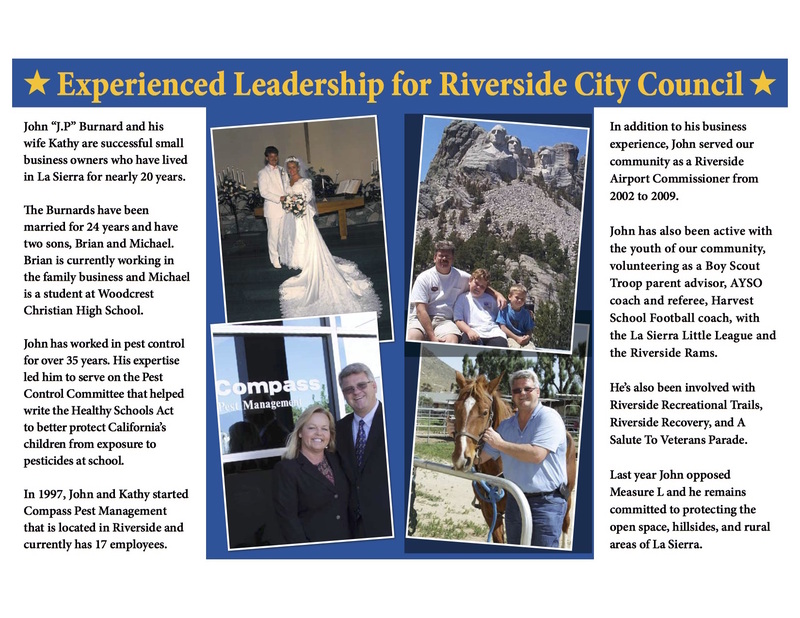 This brochure was used to introduce my candidate John Burnard to the voters of the Riverside City Council ward where he was running in 2015. As you can see, the graphics and the visuals of your mailers need to look good. Pay a professional designer to do it. Don’t ask your kid to do it simply because they are better on the computer than you are. On that note, you should definitely consider having a professional design your campaign logo that will go on all your materials. That’s your brand and it needs to look good and be consistent. If you don’t have or know a designer, 99 Designs is a great place to start. It’s where we got our logo for The Campaign School when we hatched the idea for this project. At some place you need to have your website printed on your mailer. I recommend that you put it at the bottom of the back side of a big postcard or the bottom of the backside of a big brochure. Providing your website allows interested voters to go online and find out more about you. On your website you can go more into detail about yourself, your ideas, and your positions on important issues. Providing it here is a way to show you have more depth on certain topics without cramming it into the copy of a mailer and rendering your mailer ineffective. There will always be voters who want to learn more about you when they get your mail, so you need to lead them back to your website rather than making them search for it on Google and possibly find some not so flattering things about you that an opponent may have put up on your website. Your website address is also a way to close out your mailer by repeating your name (which should be a part of your website domain) and generating more positive name recognition. 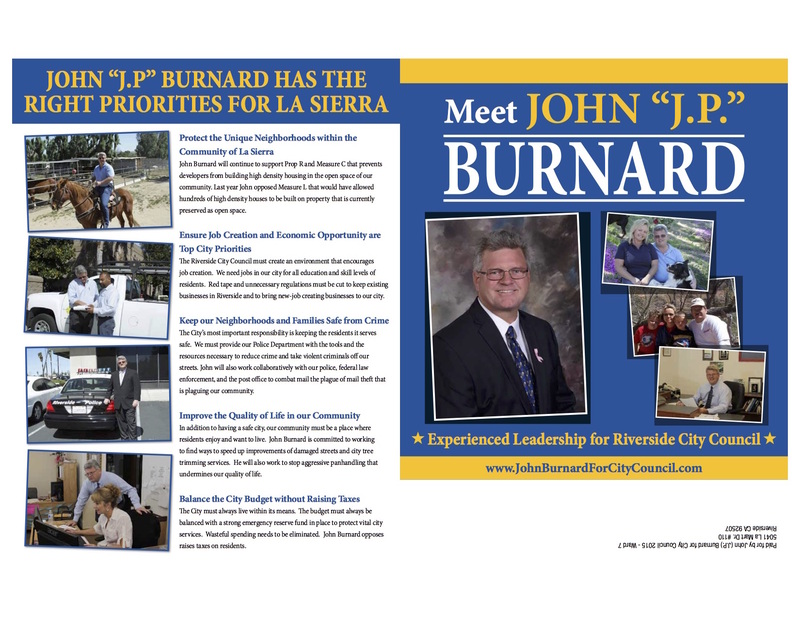 I’ve also included it on the front of mailers, like I did here on the brochure for John Burnard. When you’re sending glossy mailers, your campaign will need to properly identify itself as the sender. Each state and jurisdiction has its own requirements for disclaimers and disclosures on political mail. Find out the ones that apply to the office you are running for and follow them to a tee. Consulting with an attorney with an expertise in elections in your area is always a good idea. Don’t try to be cute or try to hide that you are sending mail to the voters. The voters deserve to know who is paying to send them this unsolicited mail. On John Burnard’s mailer above you see the disclosure information is upside down. That has to do with the labeling requirements of the USPS. 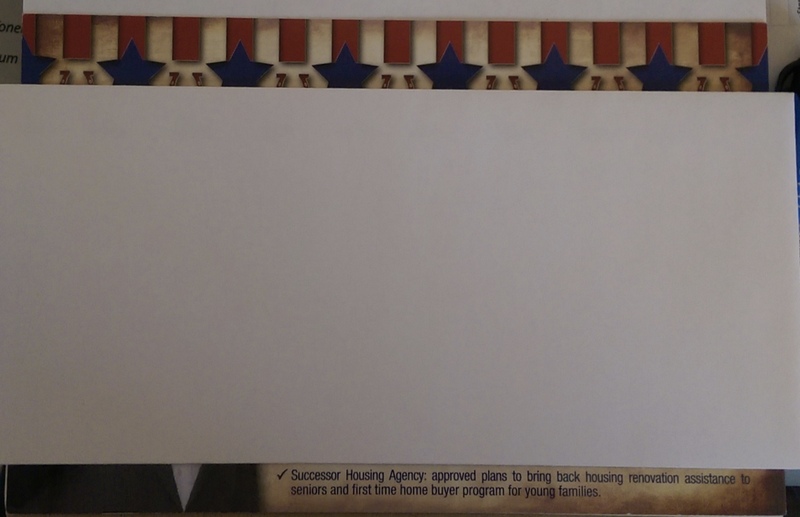 The front of his mailer is actually upside down, as the voter’s address has to be at what we would consider the bottom but he post office considers the top of the brochure. This was not an attempt to be cute. Cutting corners or not following the rules is never a good idea for a candidate or campaign. It may not seem like a big deal, but it is — especially if you get caught — which you probably will. Violating campaign laws and regulations often comes with financial penalties and other sanctions. You don’t need to be blowing more money to pay fines by not following the rules. Mailers cost enough without a campaign adding to its cost by racking up the penalties for failing to make the required disclosures on your mail. 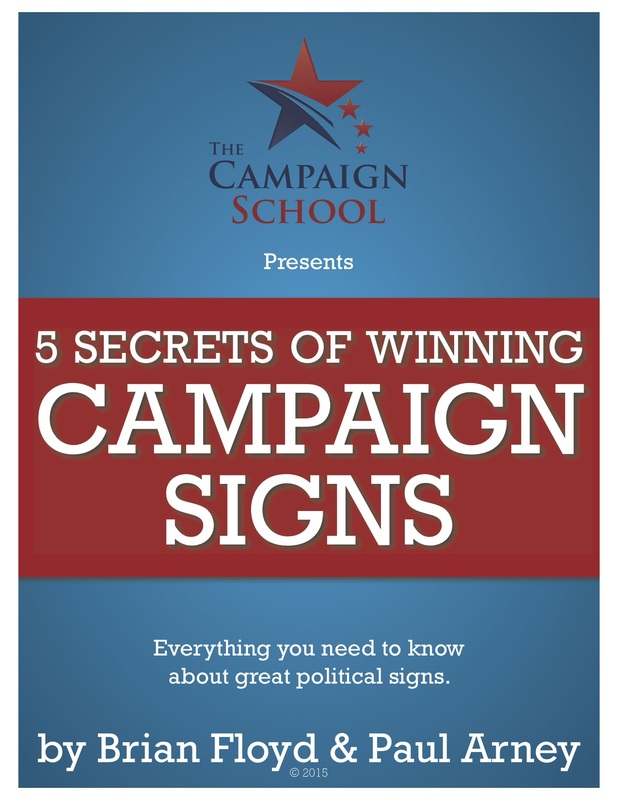 If you follow these 7 rules you’ll be on your way to producing glossy mailers that will grab and hold voters attention, which is imperative if you want to win your election and make a different for the people of your community.